Cobo Bay is another probable landing site for an invasion. 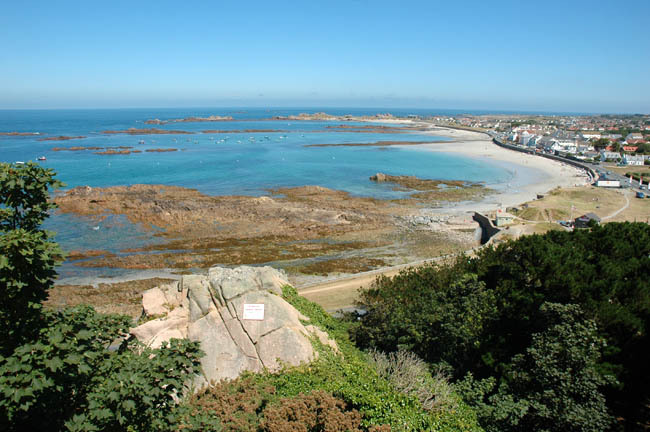 We start here at Grandes Rocques where Stp Grossfels covered Saline and Cobo Bay from the north. More to the south in the middle of the bay two 4.7 cm Pak casemates, an St bunker for personnel and one for armoured turret survive today, this is Wn Coboufer. The Germans built an observation bunker next to a Napoleontic watchtower more inland near Le Guet. Some trenches can still be seen too. At the Burton Battery along the coast towards Vazon Bay was another small resistence nest. Overlooking Cobo Bay with in the background the Grandes Rocques headland, and on the right Coboufer.